For the first time ever, NASA is watching a white dwarf star, a death star, slowly consume a planet. Scientists have found that “Death Stars” don’t just exist in galaxies far, far away. Researchers from NASA have found a real death star, in this case a faint white dwarf, that is slowly consuming its planet. With the aid of the Kepler Space Telescope, scientists at NASA have been studying a dying solar system. The sun in this solar system has long since matured and passed its bright, burning stage. Now, the remnant white dwarf is consuming a nearby planet, offering scientists a rare glimpse into what happens when a solar system dies. Scientists have long known that stars will eventually run out of fuel, and that when they do, their solar system will go with it. Still, little information has been found on what happens to a solar system when it does die. 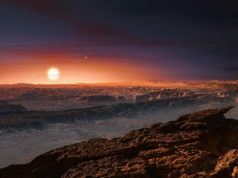 The on-going interaction is helping researchers understand what happens when solar systems enter their death spiral, and is perhaps even offering us a glimpse of our solar system’s eventual fate. In the galactic sense, the on-going death is taking place on a rather small scale. The planet is only about the size of Texas, or roughly the same size as our solar system’s largest known asteroid, Ceres. The star, meanwhile, is only about the size of the Earth. A white dwarf star is considered to be the final stage in the life cycle of smaller stars, such as our sun. Essentially, when a star uses up most of its hydrogen, it expands into a red giant. In the process of this expansion, some planets may be destroyed, and others flung off their rotation, resulting in debris. After these red giants use up their fuel, they sometimes shed their outer layers, creating a nebula and leaving a small, dense, and faint core behind. This faint core is a dwarf star. Such stars are often only about as big as Earth, despite containing approximately half the mass of the sun. 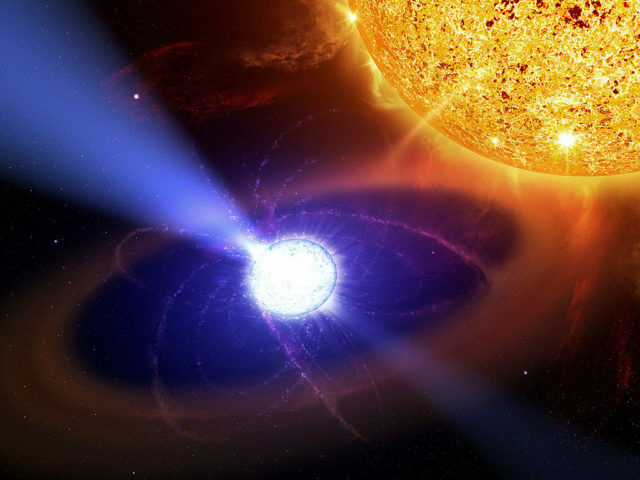 Now scientists are watching a small white star slowly destroy a small planet. Over the course of the next million or so years, this planet will suffer a slow death, being slowly disintegrated as the star’s gravity eats away at it. So too will the dwarf star. Such stars no longer generate new energy through fusion. Instead, they can be thought of as a massively dense ember of the former star. While dwarf stars are very dense, they are not dense enough to collapse into a black hole. Larger stars often go supernova, creating a massive explosion that is capable of destroying entire solar systems and more. The superheated core that is left behind is often so dense that it collapses in on itself, creating a black hole.